But you have no idea how happy (and relieved) I am to see it looking like this - with the correct day and date showing. Yesterday morning, I made a classic faux pas - I ignored my own advice. Came to get this watch out of my collection box for a group photoshoot. Found its battery had run out - it hadn't been worn (or even looked at) for a while. The time when it stopped was showing 1:05. The day window showed SUN, which was what I needed, but the date display was on 8. I decided to take the photo there and then (and replace the battery later on, which I did yesterday afternoon). One other little tip: If you buy a 7A38 with a flat battery (often a gamble in itself), or if you've left one for a long time, in a collection box or drawer, and the battery has run out, particularly if the day / date windows are fully aligned (regardless of the language shown) and the time is shown between 9:00 and 3:00 - you don't actually know where it stopped. I've found that 7A38's batteries will often expire after midnight, as the watch draws slightly more current while it's doing the day / date change-over. Once you've fitted a new battery, pull the crown out to the second click, and rotate the hands through at least 12 or possibly 24 hours, so that you are absolutely sure what time it is displaying: say 1:30pm rather than 1:30am. If you 'over-shoot' - wind it on manually another 12 hours, just to be safe. Looks like I got away with it this time. A bit of subdued Spanish bling this afternoon - my erstwhile NOS RACER J39024-50. Today it´s the 7A38-701A; still my favourite 7Axx. 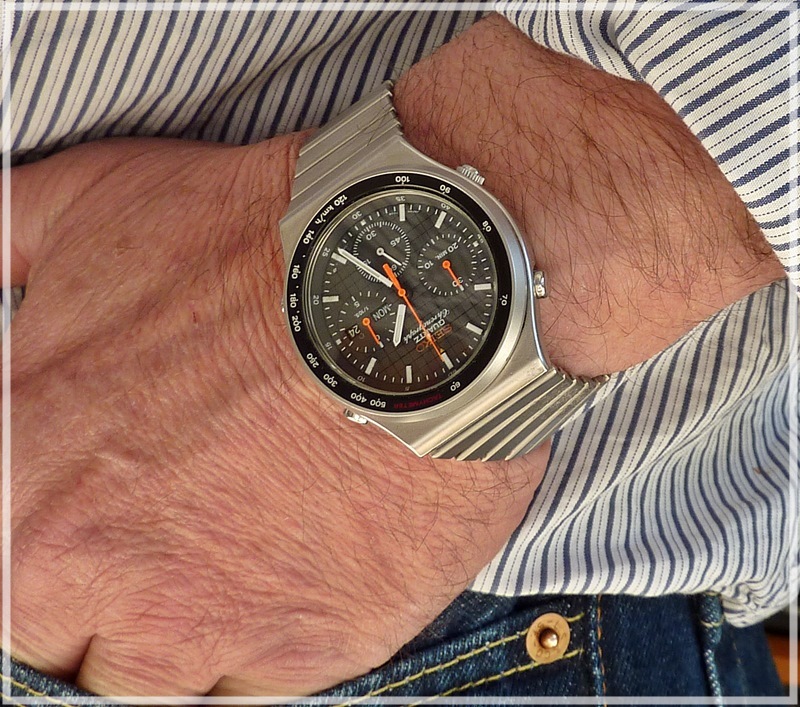 Like my Titanium Citizen 3531 I already liked this watch back in the 80´s. 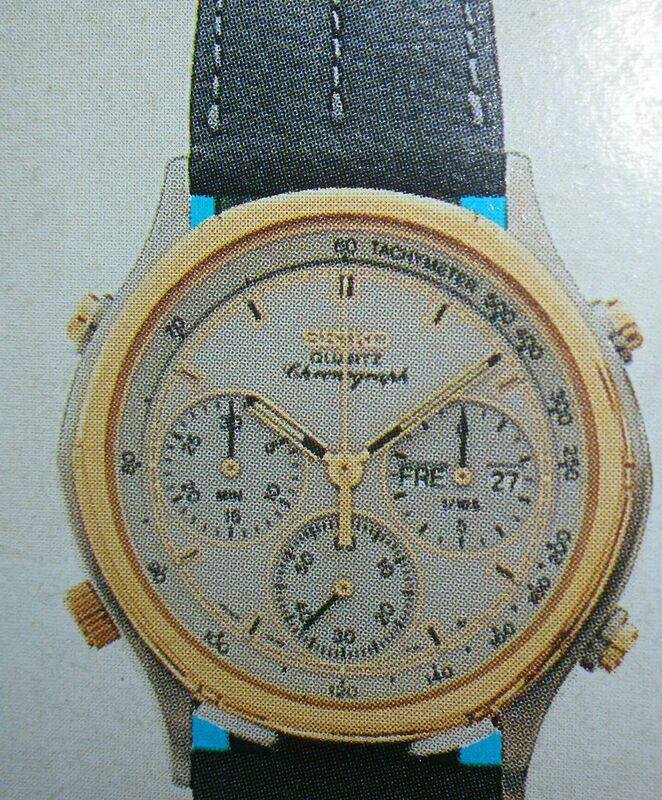 But being a poor student at that time these watches were too expensive. Now I enjoy wearing them. On the grille of my '50 Mark-6. @ donwatch: For less than 80 USD? That was not only a quick buy, but also a very good one. 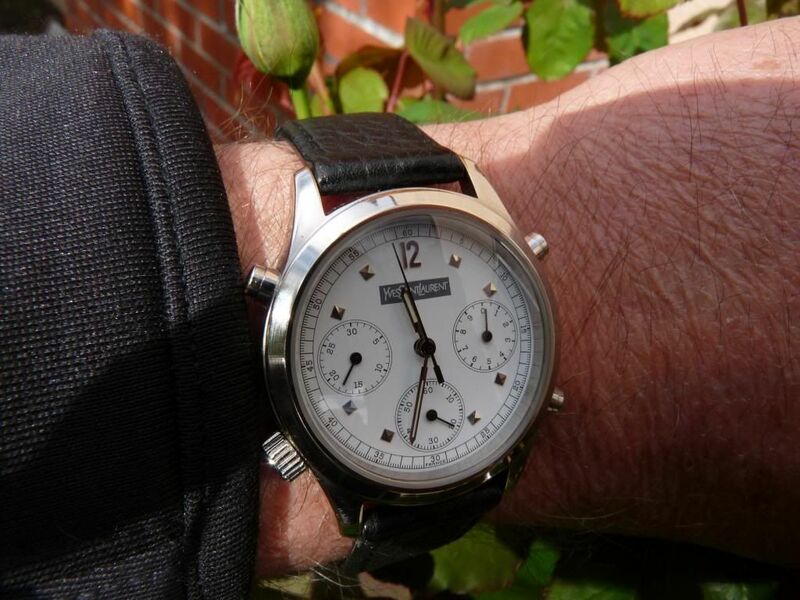 @ gufi: Another superb 'jeans pocket' wrist shot, Achim. I'm working on my (photo) response / technique ! Fantastic last few watches.. I just got myself one of these YSL, I kinda like it! Clean. @donwatch nice catch, but the minute ring should be correctly refitted. 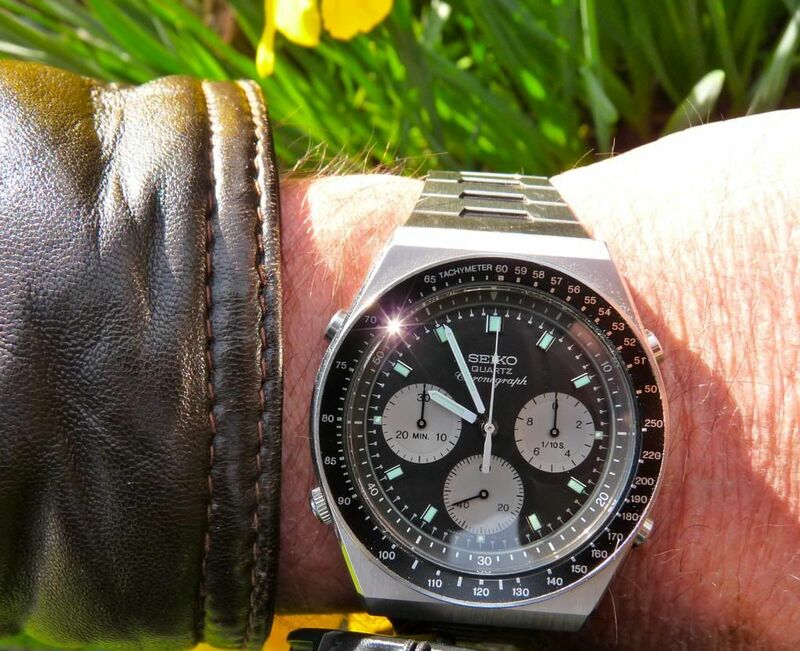 With Mark MMC's W&W article featuring a stainless 7A38-7060 on a black leather strap, this morning's wrist shot might appear that I'm deliberately trying to be topical. Quite the contrary, dear readers. More a circumstance, I'm afraid. I opened the watch collection box containing this watch, with the intention of getting something else out .... and found the battery had also run out on this one. 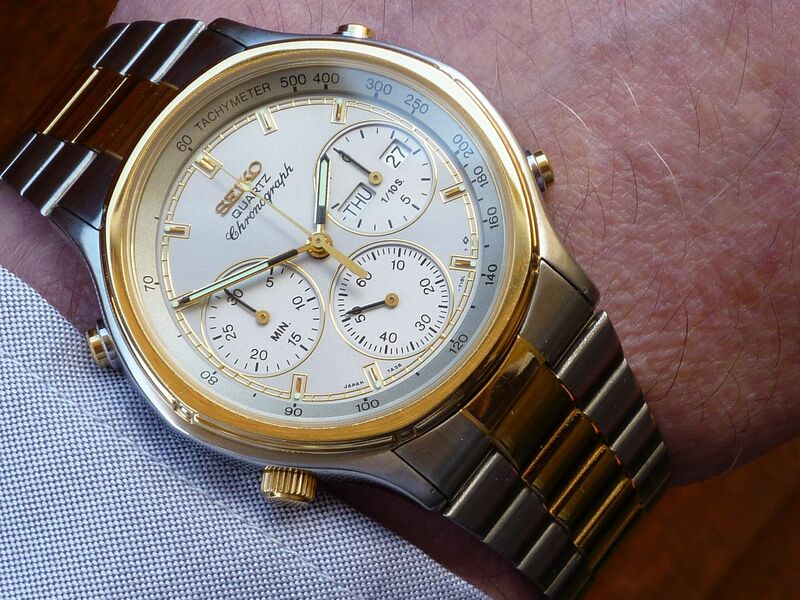 I bought this one back in September 2009 (it came on the original Seiko p/n G1105S bracelet). Since then, I've acquired a couple of better examples, including a 'NOS' and so this eminently wearable watch has languished virtually unworn. I had toyed with the idea of converting it to a 'Panda', but the right lower dial plate donor hasn't come along yet. I suspect, like this one just did, quite a few of the 7A38's that have now been in my ownership for nearly 5 years are going to be needing new batteries fitting in the very near future. 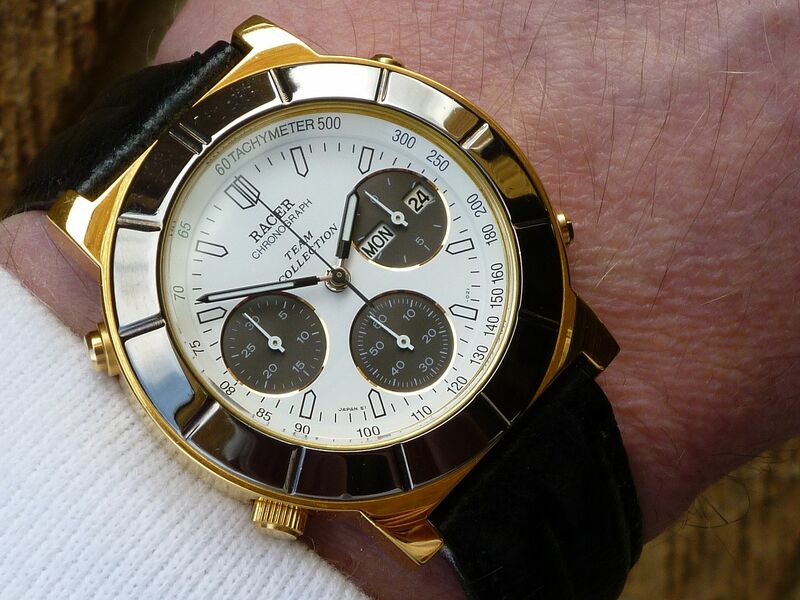 Gorgeous watch, very similar to one i'd like to one day have. As for today, I received the new 7a28 bezel insert from Harold and fitted it on the watch during my lunch, very nice now. Eventually replacement crystal once i've acrued enough tools, and an original band (if I can find one). Slowly becoming Seiko Enthusiast.. Learning..
7A28-7039 REDO---Inner bezel now located correctly. 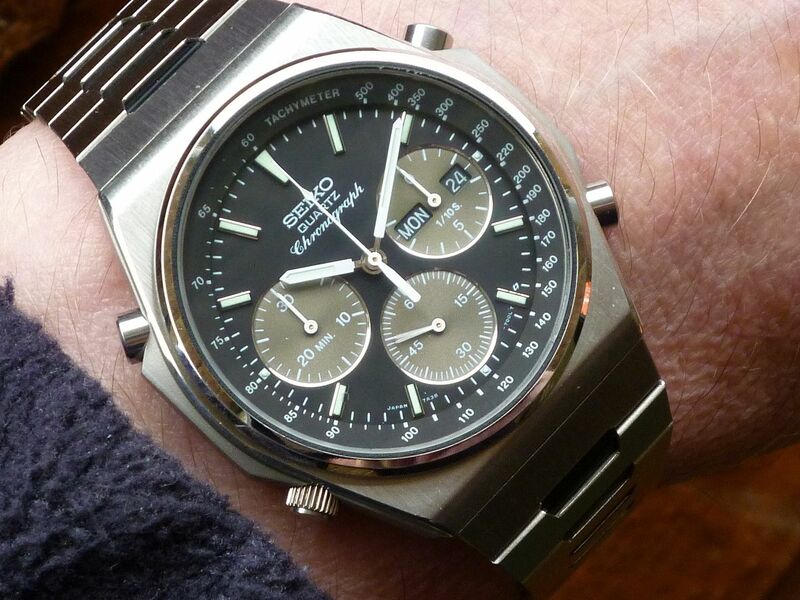 This was what I'd been intending to get out - a two-tone 7A38-7260 fitted with a non-original Seiko p/n Z1623C bracelet. I've written something about this watch somewhere before in the WRUW thread - you're welcome to page back though if you like. Won't hurt to repeat myself. I'd fitted this bracelet back in August 2009. This watch was the first (of 3) two-tone 7A38-7260's I bought. It came on a horrible ill-fitting Spiedel 18mm two-tone bracelet. 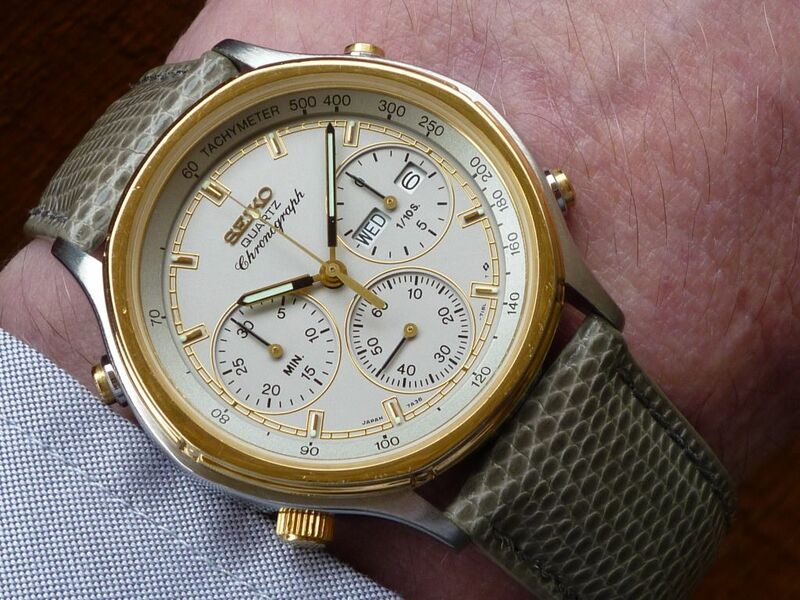 Soon after I'd bought another, which I'd fitted with a grey lizard strap. Rather than have two watches exactly the same I decided to mod this one slightly. 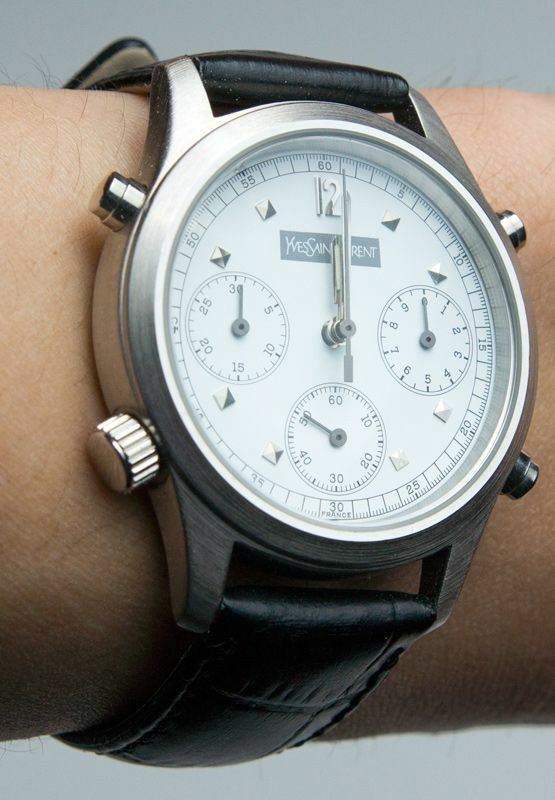 (The 7A38-7260 was never offered on a bracelet). 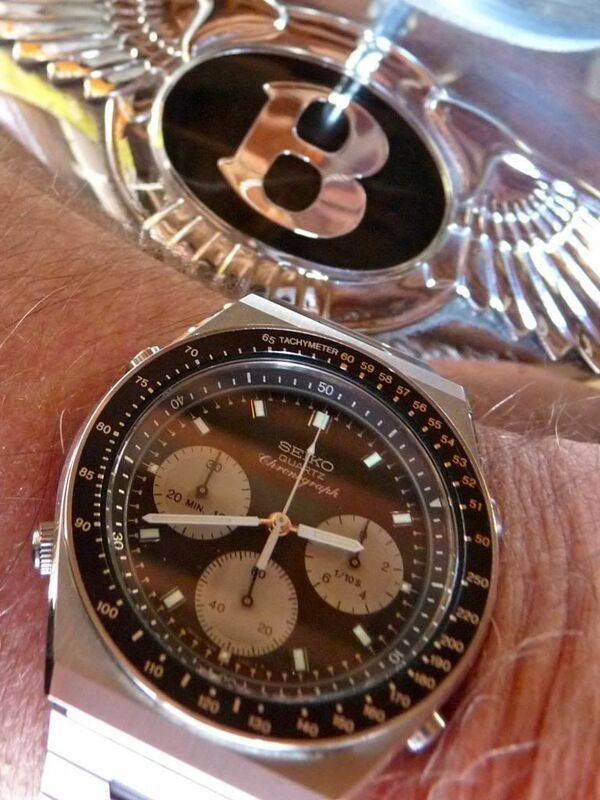 Earlier in the year I'd bought a couple of NOS Seiko bracelets 'on spec'. One of them was this p/n Z1623C. It had 20mm end pieces, but they still needed a LOT of careful re-profiling to fit the elliptic 7A38-726X case. 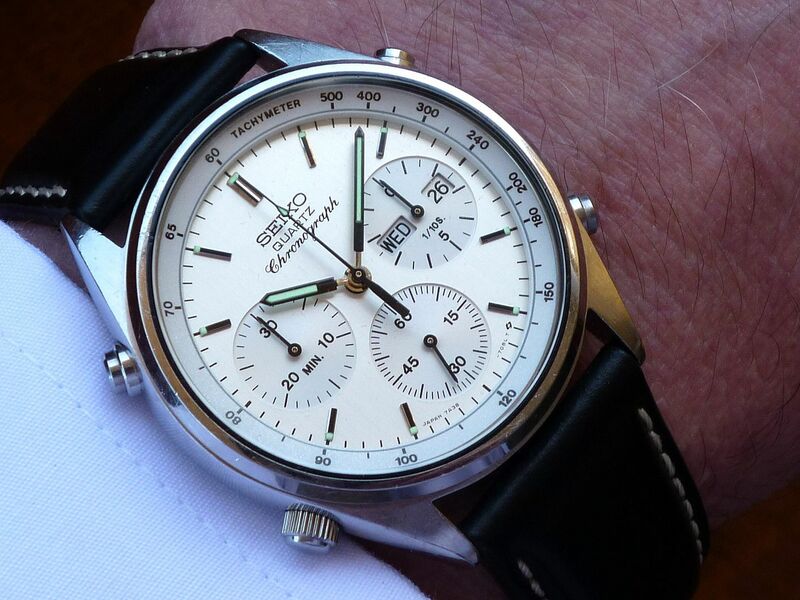 Always been very pleased with the result - a better fit than I've ever seen on any Seiko. 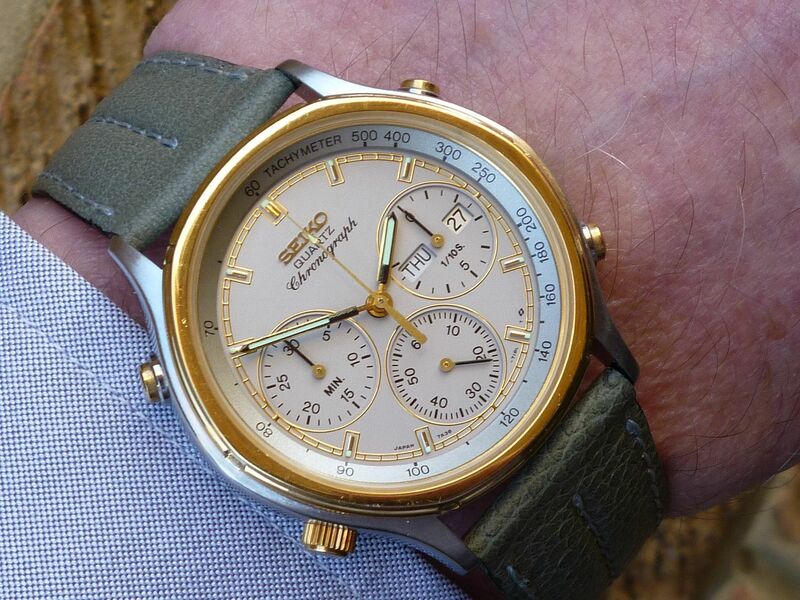 I liked the overall look of the watch - similar to the 7A38-7069 and the two-tone 7T32-6A59. 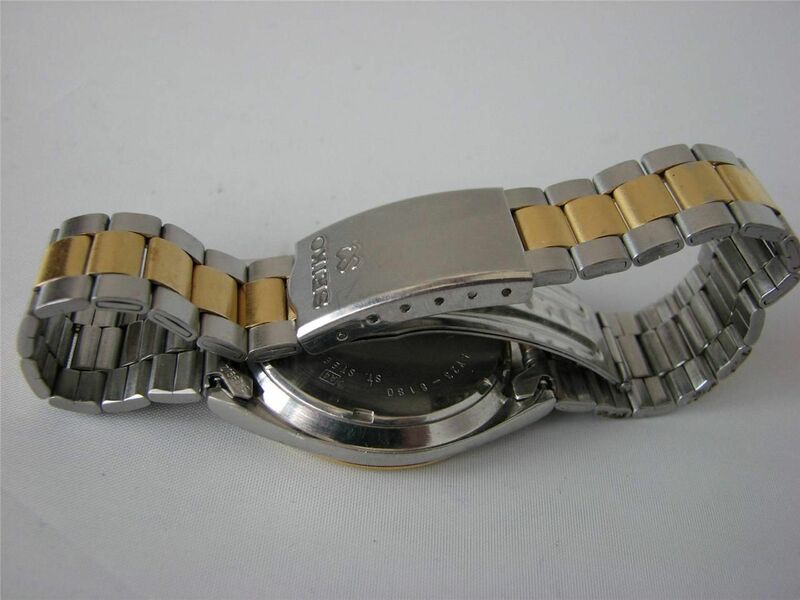 What had always bugged me was not knowing what the original watch this bracelet belonged to was. If you try doing a reverse look-up (ask 'where used') on Seiko Oceania's database on p/n Z1623C, it comes up as no data found. To cut a long story short, on Tuesday evening, I'd been idly browsing eBay and I found this US listing for a two-tone 5Y23-8180. Although it looks very similar it's not actually the p/n Z1623C I'd hoped it might be, but a p/n Z1563C (which is on Seiko's database). Close, but no cigar. Anyway - that's why I'd got this watch out of the collection box to check. Last March, Andre very kindly helped to extricate this strap from an intransigent German eBay seller who wouldn't ship 'Ausland'. It's a (very) nice to have, as far as I was concerned, but I still prefer the watch on the light grey leather lizard strap I fitted myself. Thanks. It was worth waiting for this. @ Don: Ah! I see you swapped out the hands, and yes I copied your black strap idea. It looks much better IMO! How did you find out? buff all the way through? @ lam--The hands just show up black on certain angles of reflection of the light----not swapped---THE plating is very thin-I buffed right through on the sharp edges---now it has a vintage look -----I may use the mvt in a 7A28-7039 I'm building.